Red Warning issued for Tamil Nadu & Puducherry coast. 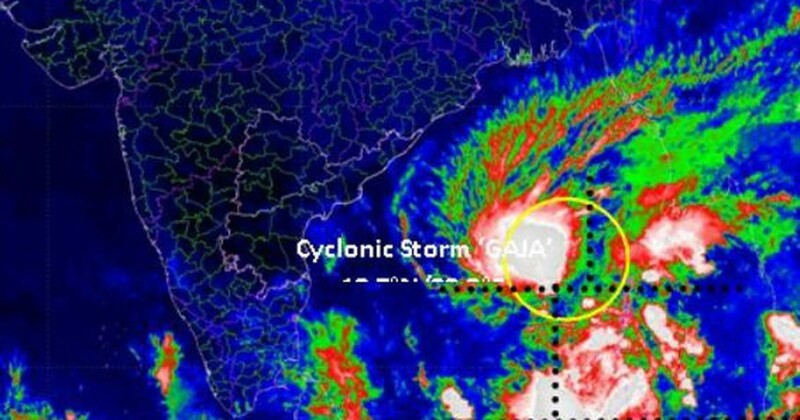 The Severe Cyclonic Storm ‘GAJA’ over Southwest Bay of Bengal moved further west-southwestwards with a speed of 22kmph during past 06 hours and lay centred at 1130 hrs IST of 15th November, 2018 over Southwest Bay of Bengalnearlatitude 11.2°N and longitude 82.0°E, about 280 km southeast of Chennai (Tamil Nadu) and 240 km east-northeast ofNagapattinam (Tamil Nadu). It is very likely to move west-southwestwards and cross Tamil Nadu coast between Pambanand Cuddalore, around Nagapattinam during late evening of today, the 15th November, 2018 as a Cyclonic Storm with a wind speed of 80-90 kmph gusting to 100 kmph. The Severe Cyclonic Storm ‘GAJA’ is being tracked by Doppler Weather Radar at Chennai and Karaikal. Rainfall at most places with heavy to very heavy at a few places over Tamilnadu & Puducherry. Extremely heavy falls (= 20 cm) at isolated places is also likely over Cuddalore,Nagappattinam, Karaikal, Tiruvarur, Thanjavur, Pudukkottai, Tuticorin and Ramanathapuram districts. Rainfall at most places with heavy falls at a few places and very heavy at isolated places very likely over south interior Tamil Nadu. Rainfall at most places with heavy falls at isolated places very likely over north interior Tamil Nadu. Rainfall at most places with heavy falls at isolated places in Nellore & Prakasam districts. Note 1: Rainfall till 0830 IST of next day. Note 2: Red colour warning means take action. It does not mean red alert. Squally wind speed reaching 45-55 kmph gusting to 65 kmph very likely to prevail along & off Tamil Nadu & Puducherry and adjoining south Andhra Pradesh coasts. It is very likely to increase gradually becoming Gale wind speed 80-90 kmph gusting to 100 kmph along & off central parts of Tamil Nadu & Puducherry coasts from today, the 15th November evening onwards. Strong wind speed reaching 30-40 kmph gusting to 50 kmph very likely over interior Tamilnadu, Kerala, southeast Arabian Sea along & off Kerala coast, Comorian area, Gulf of Mannar and Palk Strait on 16th November. Strong wind speed reaching 30-40 kmph gusting to 50 kmph very likely to prevail over southeast Arabian Sea and along & off Kerala coast on 17th November. Sea condition is high over Southwest Bay of Bengal. The sea condition is very likely to be rough to very rough along and off Tamil Nadu-south Andhra Pradesh coasts and high along & off Tamil Nadu & Puducherry coast from today, the 15thNovember evening onwards. 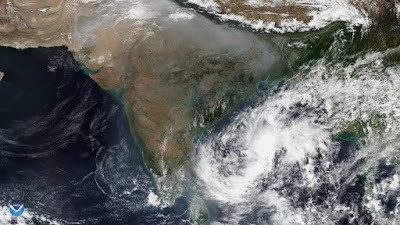 Storm surge of height of about 1.0 meter above astronomical tide is very likely to inundate low lying areas ofNagapattinam, Thanjavur, Pudukkottai and Ramanathapuram districts of Tamil Nadu and Karaikal district of Puducherry at the time of landfall. Major damage to thatched huts/houses, roof tops may blow off and unattached metal sheets may fly. Damage to power and communication lines. Major damage to Kutcha & minor damage to Pucca roads. Breaking of tree branches and uprooting of large avenue trees. Damage to paddy crops, banana, papaya trees and orchards. Sea water inundation in low lying areas after erosion of Kutcha embankments. Total suspension of fishing operations along & off Tamil Nadu & Puducherry and adjoining south Andhra Pradesh coasts during next 24 hours. The fishermen are advised not to venture into Southwest & adjoining westcentral Bay of Bengal during next 24 hours. After landfall, cyclonic storm likely to retain its intensity of cyclone for about six hours. Hence gale wind speed reaching 60-70 kmph gusting to 80 kmph is likely to prevail over adjoining interior districts of Tamilnadu. Heavy to very heavy rainfall at a few places and isolated extremely heavy rainfall is also likely over these interior districts during the same period. It is likely to cause damage to thatched huts, minor damage to power & communication lines due to breaking of tree branches, damage to Kutcha roads and some damage to paddy crops, banana, papaya trees & orchards.